Additionally, I had a conversation with a senior employee at ESPN who wanted to make it clear that this was not a mandate or a demand from the company, that it was a people first decision and that assignments are switched all the time. Unless someone tries to take down Dave Weekley statues between now and kickoff. In which case ESPN will be royally fucked. But, seriously, is there anything more pathetic than ESPN believing people would be offended by an Asian guy named Robert Lee sharing a name with Robert E. Lee and calling a football game? 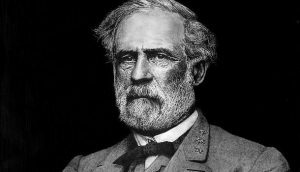 Aside from some hysterical photoshops and Internet memes which would make everyone with a functional brain laugh — Robert E. Lee pulling out all the stops to stay in Charlottesville now! — what was the big fear here? Does ESPN really believe people are this dumb or that having an Asian announcer named Robert Lee is too offensive for the average TV viewer to handle? I’m sorry you work for such an idiotic company, Robert Lee. But just to make it clear for everyone out there, the Asian man on the right is not long deceased Confederate General Robert E. Lee. He’s a different person entirely, one that is still alive and did not fight in the Civil War. And this is Confederate General Robert E. Lee. Every time I think MSESPN can’t possibly get dumber, they get dumber.